I know, this HAS to be THE MOST AWESOME giveaway ever, and a fantastic way to start off June for all the KiddyCharts readers – an amazing prize for you all, so without further ado, lets crack on and explain. Get on it as soon as you can; and don’t forget to check out our other competitions listings on the site from other blogs, as well as the other open giveaways that we have. It is also work subscribing to our weekly newsletter so you don’t miss out on this wonderful stuff! Finally, there is also a refer a friend option on this giveaway; so grab the link you get when you enter – share and tweet it out, and you can gain an extra 10 entries for those friends that use the link to enter. The closing date for this gievaway is 7th July at 11.59pm. I like the Ditsy Floral girl jump suit it’s really pretty and girly. So many nice things but love the girls Danielle dungaree dress. I love all the toddler girls clothes, but I especially love the Jnr Maisy Girls Woven Dress. I love everything about it – the style and the colours are beautiful. It also has the same name as my beautiful wee daughter! Wow… I’d gain so many brownie points if I win. This is my wifes favourite brand! I love the Scary Fish Boys Animal Poncho. Bright, practical and fun, and most importantly my boy would love wearing it. I love the girls clothing. They have so many lovely dresses in really pretty and unusual prints. I love the nautical look so I’m in love with the Emme girls striped dress. My dinosaur obsessed son would love the Boys Long Sleeve Applique Top, Navy! I love the JNR JOSIE girls playsuit, perfect for days on the beach. Boys Long Sleeved Shirt, Blue Check looks so ccol! I had a browse through the older boys section as my 11 yr old is desperate for new clothes. He had a browse with me and loved the Boys Zip Through Sweat, Navy Marl, JNR Jarrett polo and the JNR Ross shorts. Boys Classic Joules Polo Shirt – loving the colour range. Baby Boys Romper, Scary Fish. My boy will look fab in it! I love the JNR Danielle Girls Dungaree Dress, because it’s so pretty but unusual, and the JNR Constance Girls Woven Dress with the blue flowers and red bow, the colours are just lovely! I love the whole girls festival collection in particular the rose capri pants, they would look fab this summer for little girls who love a touch of floral! I love the gillets, think they would really suit my niece. There are also some really pretty dresses. Love Joules. I always like my boys in polo shirts, love the Carmine Stripe one extra much :) The Joules range is amazing, they are such a great quality too! Love the boy’s rugby shirts as it the classic Joules look. I also like the Mariners coat as yellow looks lovely on my son. The boys Chevron Padded Gilet is stylish and practical. Love their collection of boys jackets, especially the Jnr Fieldcoat Tweed and Jnr Jarell Mariners. I love this Boys Classic Joules Polo Shirt, Flare Orange, its a fantastic colour and my two boys love orange and they look great in this kind of top. SO much to choose from and all so lovely. I love all the Constance style girls’ dresses. I love the Girls Sleeveless Dress, Creme Floral Horse R_JNRCROQUET and I know that my little granddaughter would look lovely wearing it! Loads of fabulous boys clothes. I love that Joules have boys clothes in nice bright colours. I have found as my son has got a bit older the colours become a bit boring in lots of shops! I’m a big fan of the rugby shirts, polo shirts and gilets for boys, loving the Bob cargo shorts, perfect for holidays! JNR CONSTANCE girls woven dress. A really pretty, yet smart dress. Would be lovely for attending a Summer Wedding as a guest. I would love the Boys Tweed Jacket, Mr Toad for my son. I really like the classic tweed design and the functional features it looks very smart. Absolutely love the Purple Boys Polo Jersey! My nephew would look gorgeous in it! I think its incredibly smart and casual at the same time and just love it! I love the jnr Josie girls playsuit. I love the Girls Sleeveless Dress, Creme Floral Horse – its pink and got horses on! What more could you want!! Boys Quilted Gilet, Marine Navy – gorgeous, very practical and great for those chillier autumn days. I love all the boys rugby shirts, such iconic Joules wear and a style that never goes out. Love love love the boys wellies with sharks on, they are adorable and i think my little man would agree! I love the rugby shirts – so modern and yet sporty. Would look fab on our young man! I love all of the girls dresses but my favourite is the Crème Floral Horse sleeveless dress, so pretty and any little girl would look beautiful. Daddy actually has a gilet not a filet, tsk autocorrect! I love Joules clothing, beautifully styled and brilliant quality. I have lots of favourites from the girls section, so I thought I would style a few outfits! CONSTANCE DRESS – such a beautiful shape, and fantastic choice in patterns, love the summer scene especially. MARINA 3/4 sleeve striped top, LAURYN striped shorts, JAMBOREE canvas shoes, AYLIN hooded gilet – A casual nautical inspired look that can be changed weather dependent by adding tights and the gilet. Love a classic breton and short combo, and my daughters look lovely in blue. You could also add the PERRELL cardigan in the beautiful lemon yellow. I also love Joules wellies, they are hard wearing and beautiful. And the ASTBURY tweed jacket is warm and stylish. Such a beautiful array of dresses. want them all for my little lady! FLoral skirts are very pretty. Flowers are beautiful and mix of colours too. They would go nicely with plain top or cardigan. Joules is known brand and their clothes are one of the best. I like traditional clothes for my daughter, which can be hard to find. Joules are good for this, I think my favourite girls dress there is ‘Valerie’. I really love the gorgeous floral dresses, and the lawn tennis dress with the horse print. Even my daughter will put on a dress if its a Joules dress, normally its just shorts or leggings !! I love the girls Badminton Polo. I have three little granddaughters who would love gorgeous in this. Oh my word!! I love the boys’ collection… it is so hard sometimes finding classic styles for boys but Joules has such a fantastic range! My favourites are the Boy’s Mariners’ Jacket (although I can’t decide if I prefer the blue or the yellow) as I know my son would look adorable in either colour! I love the harlequin polo shirt for boys. My nephew was wearing it earlier this week and he looked super smart and the quality was fab. I love some of the gorgeous girls summer dresses especially the blue spot one and the horse print leggings and top would go down a treat with my eldest, my youngest would look fab in the pink stripe fleece. I love the girls dresses, especially the Jnr Katy Pinafore style, it sums up my little girls style, pretty but practical. I love the gilets the padded Marsha is a fave! I love all the girl dresses, I would love to get each of my the Girls Woven Dress, Border Print! I love the Girls Blue Rose Capri Jeans!! All the girls dresses are beautiful especially the Constance Jnr and for my son I would choose the Mariners jacket. i love the different types of leggings x my grandaughter wont wear skirts or dresses! JENNIE KELLER – TOP QUALITY AND STYLE FOR ALL AGES. I love the boys clothes, they are great because they wash and last really well. My son had a couple of pairs of shorts that he wore all of the time and they still look new, my youngest should be in them this year. I love the girls dresses – they are so chic – great for holidays as they can be great for day or evening wear!! I love Joules polo shirts. They are simply the must for every country show. I still have my own from the kids section when I was younger! I love the boys rugby shirts as they’re fun but practical! Perfect for an English summer and my boys look cute in them too! Love the stripe t-shirts and chino style shorts and the boys boxer shorts. love the festival wear, can’t wait to be able to take my son. maybe next year & the JNR BOYSWELL wellies would look amazing! I like the JNR Harry Jersey Polo Shirts they look smart and casual so suitable for a day out or a special event. I also LOVE the Grumble boys tweed flat cap and think my son would look so cute in it! I love the girl’s cotton dresses, they are so pretty, yet so practical and wash and wear incredibly well. It has to be the constance girls woven dress. Very pretty and almost 1950s ish. I love the girls’ dresses. Especially the Jnr Constance designs. I also love the iconic Joules polo shirts for girls and boys. Girls Summer Dress, Creme Sea Side Print; Sadie sweat dress; Girls Hooded Raincoat, Candy Pink Pony Print; Boys Tweed Jacket, Mr Toad; and Boys Long Sleeve Applique Top, Navy. I love nearly everything because of the great colours, patterns and quality, but especially the Girls Printed Welly, Candy Pink Pony Print. What I love most about Joules clothing is how well it washes and how well it lasts. That’s worth paying for and even better to win.What I would love to buy currently is another Joules Junior scarf: LBG has one and Dimples is deseprate for one but now they are sold out. No other store does kids summer scarves yet all my girls want is one so that they can look like me! I love this jacket especially the little ears. They grow up quick enough so I love the cute things while you can. The applique t shirts are wonderful too! My brother is getting married in August and my first baby is due at the beginning of July. I’m looking for a wedding outfit for baby to wear – because we don’t know if baby is a girl or a boy yet I keep looking at both outfits just in case. I really like the Red Check Baby Drew Baby Girl Dress and Bloomer – but it might clash as the bridesmaids are in purple lol. Boy wise I’d probably go with the Baby Tristian shirt and try and get a pair of jeans – then again denim probably isn’t a good choice for a wedding…..maybe need a new idea for that one. Fantastic Blog, And Brilliant Giveaway. i love the josie baby girls dress and matching pants, the baby isabelle 2 piece set for girls. for boys i like the JNR ross shorts in red with the JNR jethro shirts. i cant decide with all the lovely shoes. The natasha womens spotted dress is a classic. all good stuff! The Robbie Boys baseball boots would look so cute on my son! I like the boys tshirts and especially the JNR Archie as the colour would really suit my son and he would really like the design of it. The whole baby boy 0-18 month section. These have to be the cutest clothes I have seen in ages! My little boy is in serious need of clothes :( everything is getting too small :( and these would look great on him! Lovely stuff in the girlss holiday shop – perfect for our 2 little girls summer hol. I love the Baby Isabelle Baby Girls 2 Piece Dress Set, Light Pink Pony. I have a new baby girl and it’s just so cute and practical. A dress and leggings which is perfect for colder Summer days and just the style I like to dress my girls in. I love the boys short sleeved stripe t-shirt. I love the girls ‘Festival Wear’. It’s so cute, bright and bohemian and perfect for the summer. My little lady would love the printed trousers and frilly tops. I love all the jersey and sweat dresses – pretty but practical and they wash really well. My favs are the gorgeous TILLY dress and the KATY pinafore dress. I love the girls wellies! this little girl’s dress is gorgeous; http://www.joules.com/Girls/Dresses/Jnr-Croquet/Girls-Sleeveless-Dress/Creme-Floral-Horse?id=R_JNRCROQUET|CRMHRSE and the little girl model is the cutest thing ever. ooo i love the Emme girls striped dress – one of my girly’s is called Emme and this would look gorgeous on her and her sisters!!!! All the little boy clothes, my wife loves them as well. I love the applique tops because I was pony mad when I was a child and would have given anything to own one of these! I also love the floral dresses and the gorgeous market scene on the border print dress……in short I love pretty much everything, but most of all I love the quality. The clothes feel soft and they wash and wear really well, so they stay looking good for ages! I adore Joules and have already bought Sebastian the Baby Duncan dungarees in both colours – wish they did co-ordinating tops though. I’d love to update Eliza, Isaac and Kians wardrobes too! I absolutely love the JNR Danielle Girls Dungaree Dress and the JNR June Girls Jumpsuit. They would be perfect for the summer! :-). Thanks for hosting such a lovely giveaway and thanks the opportunity. I love the stripey boys sweatshirts and would mix and match then on the two fiords £40 offer. I love all the stuff on their site. Have a couple of bits we have picked up from car boots and they seem to go on forever. Great competition. My kids are looking very scruffy at the moment so could do with a bit of a polish! My favourite for boys is always the polo shirts, the quality is amazing! For girls the prints are super cute and the colours are so girly and sweet. 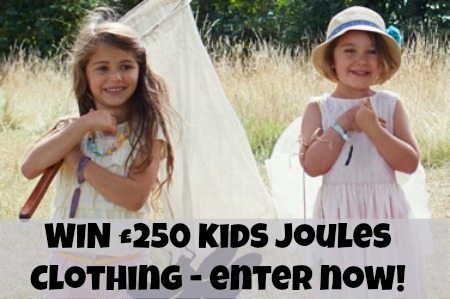 I love Joules, kids and adults to be honest! If I won I’d be buying polo shirts, body warmers, cute dresses and t-shirts and wellies. They do great wellies! I love the girls tunic dresses, they are so versatile and you can dress them up and down. Grotbags loves the horsey range. I love the girls dresses, especially the Candy Pink Pony Print Tennis dress. I’ve bought a few similar dresses for my little granddaughter, I just think they look so stylish and lovely on and because its pink! I love the applique tshirts and long sleeved tops. I love applique because its so colourful and different and some of these even have dinosaurs on them, which would have Potato literally roaring in delight! The red gingham skirt looks lovely. I love the boys festival clothes, the t’shirts especially as their all age appropriate which is ideal for my little man who is big for his age I don’t want him dressed in dark colour’s or skulls. Also love the stripey sweatshirts their fab! I just love the Baby Boy Ziggy babygrow. I’m pregnant with my second baby and it’s a boy! I found clothes for girls amazing (my first child is a girl!) and there was an abundant choice but I’ve struggled with clothes for this one so it’s nice to find a company with such a great range! I adore the jnr Jarell boys mariners jacket. Such a fun colour and a great lightweight jacket ideal for the British summer time! I’m in love with this raincoat but Joules always has the cutest kids clothes anyway. You can also put any of their items together and they look great. They definitely have a specific aesthetic that they do well with. For my son the Boys Shorts, in Bondi Blue would be great for summer, so stylish and could be dressed up or down. For my girls I love the pretty dresses with the ribbon detail such as the Girls Woven Dress, Blue Rose and JNR CONSTANCE Woven Dress. Perfect for the summer holidays. I love the Boys Toweling Cover Up, its perfect for a day down the beach when the clouds roll in – they can pop this on and let the fun commence! Love the Boys Rugby Shirts – which one though is a dilemma!! I really love their baby items, they are so cute especially the flowery dress and pant set, simply adorable! Fabulous designs and unbeatable quality, i love Joules. I love it all for my 7 week old daughter… I particularly like the Baby Isabelle 2 piece set but basically I want one of everything! I really love their baby items, they are so cute especially the flowery dress and pant set, simply adorable! I like the ARCHIE t-shirt with the shark on it. I’d also go for the Blue Shark Print swim shorts to go with it. My grandson would love them, he’d look very smart on the beach! I like the Boys JNR BOB cargos shorts because they look comfy for a boys tummy. Whilst looking smart they can be comfy. I love Joules range of boys clothing. I do struggle to find decent boy clothes, this site is fantastic as they have so much to choose from that is practical and stylish. I love the JRTOMSTRIPE Boys Jersey striped polo, great for summer, would look splendid with shorts or jeans. Love their JR Boys Cargo shorts! I love the girls woven skirt, red gingham – because it looks so pretty. I love http://www.joules.com/Girls/Jumpers-Cardigans/Jnr-Celine/Girls-Jersey-Cardigan/Creme-Meadow?id=Q_JNRCELINE|CREMMDW as it is pretty and would go with alot of my daughters clothes plus you can wear it all year round! The pink Mabel Girls quilted jacket is gorgeous – my 4 yr old daughter loves pink so would adore this! Love the BOYS’ WINTER WARMERS. we live ‘Up North’, so always need warm clothes. Boys Tweed Jacket, Mr Toad would be great. My daughter is a real tomboy but she has been after some specific blue boys shorts from Joules for a few weeks as she has grown out of all last years clothing! The sweatshirts and hooded tops are brilliant – if I had to pick just one, it would be the Boys Over Head 1/2 Zip Sweat – it’s got a Dark Blue Stripe and Is Gorgeous !!!! I love the Girls Pinafore Dress, Blue Sea Side Print because it cooks cool to wear and the print is really pretty! My youngest daughter would love it! I love the Girls Jump Suit, Ditsy Floral – it would be perfect for our holidays!